They’re still at it. 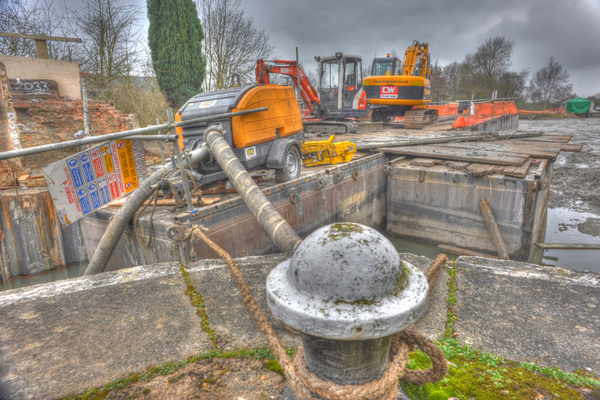 The British Waterways contractor May Gurney is cracking on with the repair work to Calcutt Top Lock. And what pleasure it is to work with them. May Gurney must only recruit staff who can easily interact with the general public because every one of their guys on site is a credit to them. So far, they’ve set up a secure compound to house their containers; staff canteen, changing and drying room, office and equipment storage. They’ve installed a dozen rectangular steel pontoons (pictured above), brought in their JCB, dumper, mini digger and powerful water pumps, removed the existing crumbling concrete and brickwork from the lock entrance, inserted pilings and poured in half a dozen loads of fresh concrete. When they’ve finished the repair work, they’re going to raise the level of our wharf by six inches as a return favour for Calcutt Boats allowing them storage for their equipment and the rubble they’ve extracted. They’re also going to remove as much silt from the wharf side as they can with the time they have free. The contractors are still on track to complete the work mid-end March. Much as I enjoy their company, I’ll be glad when they’ve gone so we can get the hire fleet back up to the wharf ready for the new season. I’ve been told that they have to have the canal open, for at least part of the day, by 11th March. But, because they will be raising the level of our wharf, we won’t be able to moor boats at the wharf for a further two weeks.